It's nearly the end of the school year before we pack up for 6 weeks then run around like crazy buying new uniform and getting all emotional at our 'babies' going up yet another year and naturally it's time schools like to pack in as much as possible into the final 2 or 3 weeks! We've just had our sports days, one going ahead as planned and one pushed back due to the rather unpredictable July weather! Midges sports day was first up. The field was all set up for the whole of the upper school (year 3 upwards) with loads of different activities some being traditional (track, sprint, long jump) and a rather odd slow bike race (yeah I'm hoping they ditch that next year!) The school tried a new thing this year in keeping with the Olympics, all children would have a great time and take part then from every year group the top 3 from each race would be invited back to a finals later in the day. This was quite nice actually because Midge tried her best but knowing she isn't very sporty she didn't expect to win anything. She did get a 4th in the sprint and did well in the sack race and would've done better if she didn't keep losing her shoes on the track event bless her! She didn't go through to the finals but she was happy with that and enjoyed cheering all her peers on in the afternoon with her fellow class mates. Roo's sports day was the following week on what started out a rather wet day. Come 12.30pm though the sun shone (rather cruelly it didn't seem all that hot so I carried on the day with no sun cream, low and behold I was feeling quite unwell and resembled a tomato come 5pm!) Roo enjoyed his day, he didn't fully understand all the races so took the lead from his friends leaving him behind so half way round I got to sit with him and explain to him one to one what he was supposed to do which helped a lot! 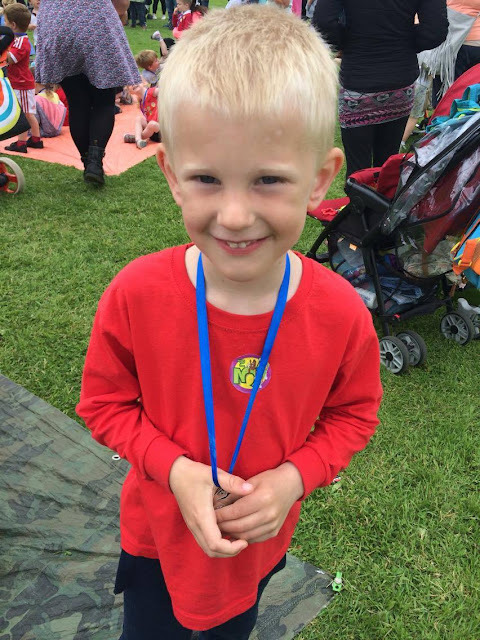 He had fun throwing bean bags into hoops, was deeply embarrassed by falling over in the sack race, had evidently inherited my fab egg and spoon race skills and came 3rd in the obstacle race so he got his sticker, yey! All the children got a medal at the end of their sports day which I thought was a lovely touch. I loved the difference in the sports days but did remember wishing that the school put more effort into younger children's day as they did the older childrens'. The teachers were all wonderful though and it was nice to be close to our children as they went around and did the events like my parents could when I was younger. 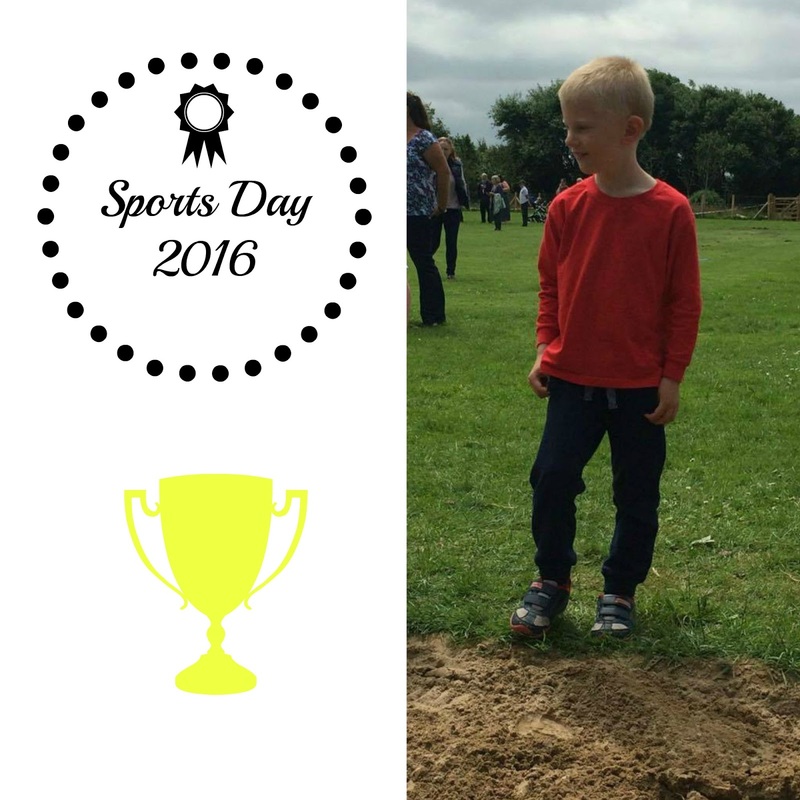 Have you had sports day yet? Do you have competitive children? Roo is definitely going to get more competitive but I think Midge will be pretty laid back about future sports days too! Sounds like Midge & Roo had a great sports day, Daisy had her sports day last week she's not at all competitive she just sees it all as good fun. I hated sports day when I was little but I'm glad to say all of my children like sports and games and love taking part and I think that's down to the way schools approach it nowadays. My Midge is the same, she's not into it very much at all! I enjoyed doing the long jump and spoon race but in secondary school i hated it so much and I think midge will be the same!